I visited the Lexington Avenue location of Shakespeare & Co. Booksellers (there are four locations) on one of the rainiest, coldest spring days that I've endured in recent memory. Unlike other indies visited, this one involved a fair amount of walking to get to. The weather grabbed my attention on this day. But you don't care about that, you're ready to hear about Shakespeare & Co. Booksellers! Since the weather was so crappy it was a slow day when I walked into Shakespeare. I was instantly greeted by Chris and Ken, the two staffers on the main floor. As with all the indie people I meet, they were great to talk to. I learned a little about the store, the area, and also talked about books and the next ones I need to take to the "unread pile waiting their turn." Visiting these indies is an absolute blast but it is just as much fun to talk to people about what books they like, what they're reading, and what are their favorites. These guys were great and quite patient while I was there. The store has a main level and lower level. The main level is where most customers will spend their time. 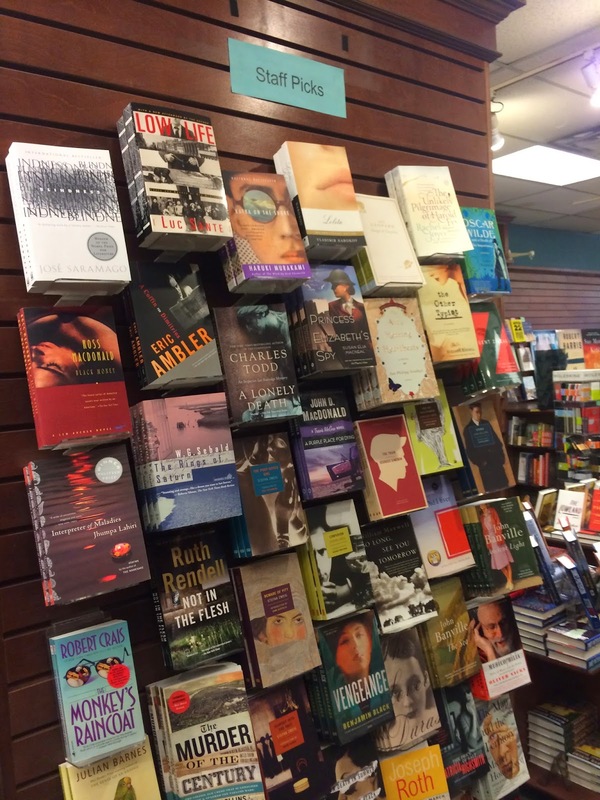 Lots of books, all the new stuff, and many staff picks. They have a text book buy back program and with Hunter College so close this is a natural. This is on the smaller lower level where you also find a very limited assortment of school supplies. The store is quite neat and has a newer look and feel but I think it has been here awhile. If you want something besides books, you'll be disappointed. There are a few book bags and some other knick-knack kind of stuff but not much. One more thing. They don't have one cat. They have two. In my short time on this project, Shakespeare & Co. wins the award with the most cats on site. Do you hear that, Spike, at Left Bank Books in St. Louis? Tiny at Community Bookstore in Brooklyn? You guys at these places might want to consider bringing on a roomie or two to catch up to Shakespeare! Go to an indie and buy a book. Bonsoir. CURRENTLY READING: The Flamethrowers, Rachel Kushner. Some people I've talked to have shot this to the top of their favorite book of all time recommendation. I like it so far but it's definitely not my all time favorite. Yet. JUST FINISHED: Wait Till Next Year, Doris Kearns Goodwin. Loved it! 4.5 stars. Growing up in Brooklyn in the 1950s, the intense passion for the Brooklyn Dodgers, and current events of that decade. But it's more than just a baseball book. RECENTLY PURCHASED: Pietr The Latvian, Georges Simenon. Confusion, Stefan Zweig. Both recommended by Chris here at Shakespeare. I have high hopes for both! Main floor looking towards the rear of the store. Long and lots of books! Chris (L) and Ken. These guys were great. Lower right corner is my guidebook, My Bookstore, edited by Ron Rice. Yours truly, Chris, & Ken standing in front of one side of the staff picks display. A great collection of staff picks. Lower level. Nothing much to see here. This area is probably very busy at the start of college semesters and during text book buy back times. 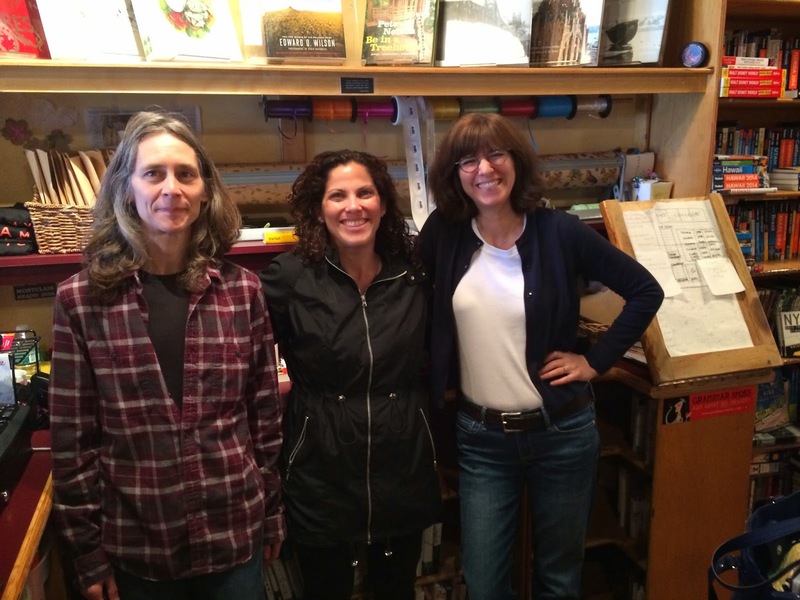 Three Lives Booksellers, NYC. I think the outside of this places looks great! Just the kind of place you want to visit! A friend of mine, well respected in the literary world, and a person who is knowledgeable of independent bookstores throughout the country recommended Three Lives Booksellers and owner Toby Cox with this glowing compliment. "Pound for pound, this is the best independent bookstore in NYC. You can go into this store blind and whatever you put your hand on and pull out, it will be a winner. I never go to this store without spending less than $100-200." When he says "pound for pound," that may be a reference that this bookstore is on the smallish side. When he says "whatever you put your hand on and pull it out it will be a winner," is a testament to the due diligence and fine job that owner Toby Cox is doing at Three Lives. I was not disappointed. This place is a no-nonsense, cut-to-the-chase bookstore. And I mean that in the best of ways. Located in Greenwich Village, Three Lives is in an older building, mixed in among small businesses and residential. It feels more residential to me though. If you close your eyes while you're in this store you'll hear the floors creak and classical music in the background (maybe they play hip-hop on the days other than my visit???). I don't know how it could be any better! The inventory, displays, and staff selections all look great. Even though it's a small store, there's a lot to pick from. When I say this place is no-nonsense, it doesn't dress itself up with souvenirs, trinkets, gifts, and lots of additional sale items. Just books. Sadly, I didn't get to meet Toby on the day of my visit. Instead, I got to meet the two super staff members who were there, Troy and Carol. Have I ever met an indie staff member I didn't like? No! Troy and Carol were knowledgeable, gave me some great recommendations, and as with so many others were very patient with me on my visit despite being busy and having so much to do. These are the kind of staff members who are the vital life blood to these indies. Take a trip to Greenwich Village in NYC, lots of unique places to visit and check out. Go down the street from Three Lives and sip a latte at a small little coffee place, Jack's. Then visit Three Lives, put your hand on a book, and pull out a winner. Go to an indie and buy a book. Bonsoir! CURRENTLY READING: The Flame Throwers, Rachel Kushner. Highly recommended from a few others, hasn't grabbed me yet. JUST FINISHED: Wait Till Next Year, Doris Kearns Goodwin. Brooklyn and growing up in the 1950s and the passion for the Brooklyn Dodgers. Loved it. 4.5 stars. On The Come Up, Hannah Weyer. Non-fiction, unwed, pregnant teen growing up in impoverished Rockaway. Loved it. 4.5 stars. RECENTLY PURCHASED: Annihilation, Jeff Vandermeer. Demon Camp, Jennifer Percy. The Daughters of Mars, Thomas Keneally. Naturally, I have high hopes for all. Naturally, I have no idea when I'll get to them. Three Lives as you walk in the front door. Staff member Troy (L) and yours truly. Troy and the great display of staff picks. Book Culture from the outside. 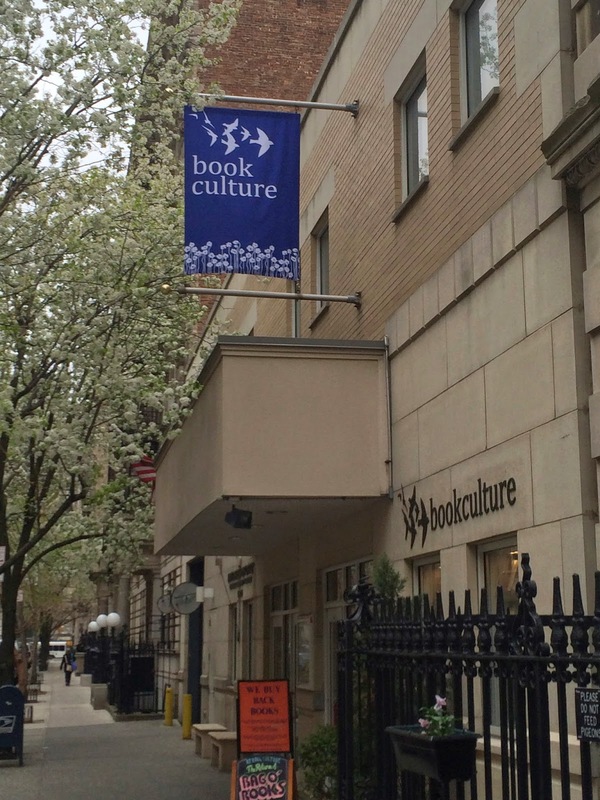 There are two Book Cultures in NYC, I visited the one on 112th St. 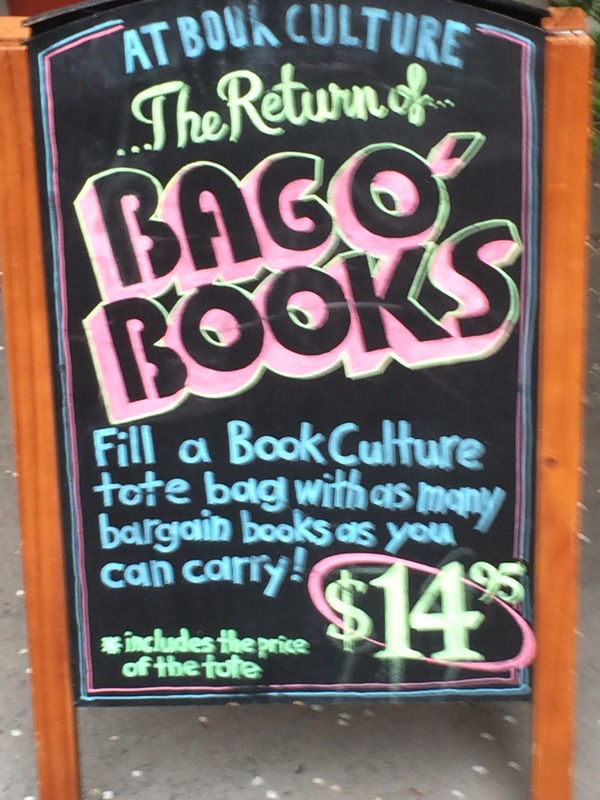 This place has everything; t-shirts, journals, magazines, greeting cards, bags of all kinds, miscellaneous gift items, and an excellent inventory of books. It has a writing table upstairs where people are encouraged to write a letter to anyone on stationery they provide. Put the letter in the box on the writing table and they provide the postage and mail it. And during my whole time there classical music playing in the background. Great atmosphere. Writing letters and books. Outdated? Not here, nor should it be. 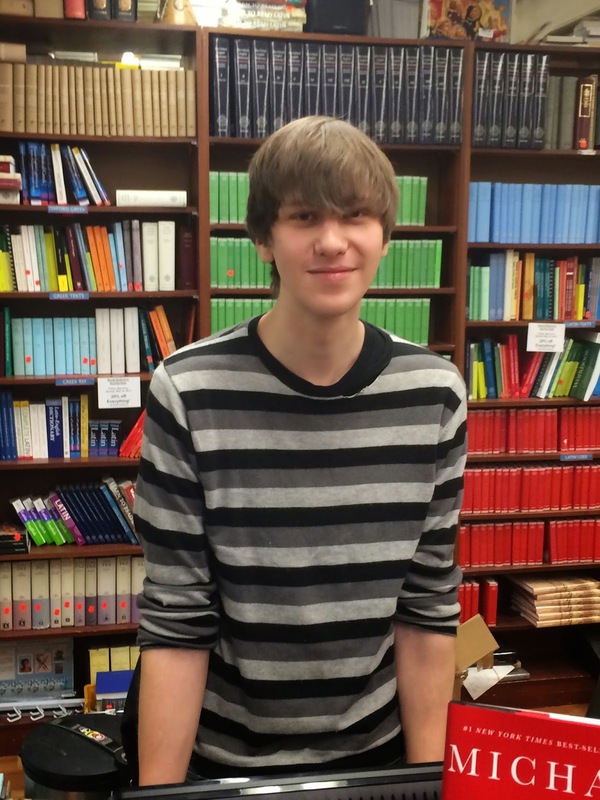 If you visit Book Culture and get a chance to talk to Chris the owner, do it. In my brief time on this project, I don't think I've talked to anyone with more passion about books and indie bookstores. I am learning a lot on this project and I wish I could convey Chris's passion in this post. But I think I can make a primary observation. Books are our heritage, our culture. But the culture is slipping away to those who really don't have a vested interest. Mega-chains, discount stores, discount internet businesses, etc. You know who I'm talking about. But the publishers have the freedom of choice. They can sell (sell-out?) to whoever they want. The trickle down effect? It compromises not only indie book stores and their employees, but authors, talent, artists, editors, and a multitude of others I don't even know about. So how do we save this culture of books? Publishers, I'm looking at you. Take a frickin stand. Put your collective feet down and take a stand Be part of an industry that does the right thing for once. You can control the indie growth or the indie (and book) demise. Don't deny your descendants what we and our ancestors have cherished. A book. Ok, I'm off the soapbox but Chris the owner can really speak to this with a knowledge of the industry. Rant aside, this place was super. They also do book buy-backs and deal in text books as well. I can't say enough about the staff at Book Culture. Brenna, Natalie, and Miguel were all great to talk to about books and about the store. Friendly, patient (thank goodness! ), and kind. The perfect combination that any customer appreciates. Also knowledgeable and ready to recommend books for your "waiting to be read" pile. This staff and the owner Chris were 5 star all the way. Thanks for a great visit, Book Culture. Now, go to an indie and buy a book. Bonsoir. CURRENTLY READING: Wait Till Next Year, Doris Kearns Goodwin. Brooklyn and baseball in the 50s and the author growing up. She's a great historian. RECENTLY FINISHED: Every Day Is For The Thief, Teju Cole. Corruption in Nigeria. Fiction but it feels autobiographical and probably includes experiences of the author. This is a good one. Tinkers, Paul Harding. Won a Pulitzer but I thought it was slow and it rambled. The best thing about it was it was short. On The Come Up, Hannah Weyer. Non-fiction about a young teen girl in Rockaway, unwed and pregnant, and her challenges to pull herself up. Outstanding! RECENTLY PURCHASED: My Struggle, Karl Ove Knausgaard. Highly recommended by Brenna at Book Culture. It's huge over in Norway. I'm hopeful. What you see when you walk in the door! Chris the owner (L) and yours truly. Miguel was covering the 2nd floor. Looking down from the 2nd floor. They even have books on the stairs! Bonus points if you recognize this landmark just down the street from Book Culture. A great spring day in Montclair, NJ to visit Watchung Booksellers! 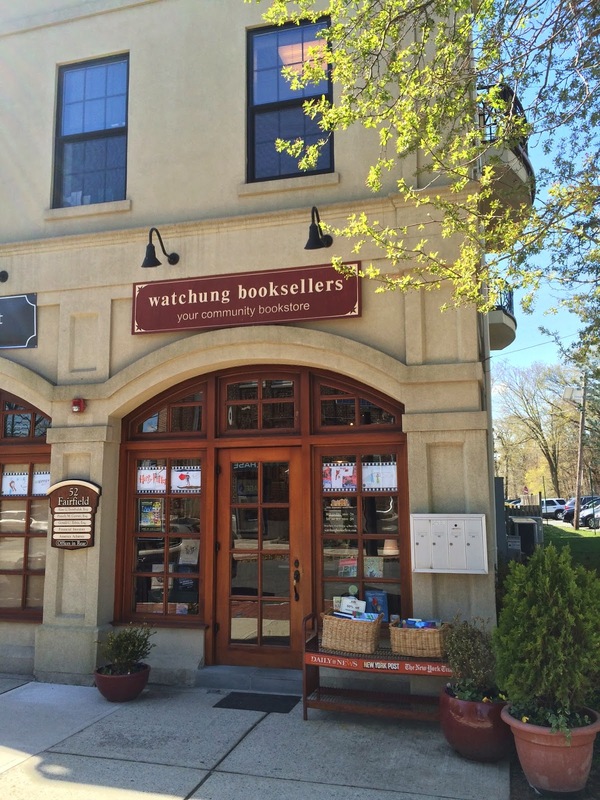 Watchung Booksellers in Montclair, NJ, is located in Watchung Plaza and this area has a very "hometown-ish" feel and look. Tulips blooming in the plaza, several small businesses, including Sunrise Bagels (yes I was there; good wifi, great cinnamon roll, nada on the vanilla latte). I would even describe it as a hometown-ish movie set-ish type feel. And Watchung Booksellers fit in perfectly. I didn't get to meet owner Margot on this visit but you can tell she and her fine staff have put in a lot of time to make this place look great, organized, and very neat. This store is long and narrow and above the bookshelves are stenciled the names of authors running the length of the store. Very cool and a great touch. Near the front entrance you can find info for various book events hosted here. Also, a great kids section in the back and that was also a lot of the business during my visit. As with all my indie visits on this project, the staff here was super. Lianne, Marisella, Jeanne, and Taylor were helpful, enthusiastic, and patient the whole time. A special thanks to Taylor who gave me some great blogging advice. If you've been a regular reader to this point you know I have issues. It was great to see that they were busy with customers while I was there and also fielding many phone calls. During my visit it gave the appearance of a vibrant and flourishing independent book store. Kudos Watchung! In addition to books you could pick up a few greeting cards and small miscellaneous items that would be of interest to kids. You can also order books 24 hours a day on their website. But don't order online, visit and buy in person. Go to an indie and buy a book. Bonsoir! JUST FINISHED: The Empathy Exams, Leslie Jamison. Getting some traction in all the indies. Book of essays, some I liked some I didn't. 2.5 stars. CURRENTLY READING: On The Come Up, Hannah Weyer. Non-fiction. I'm half way through it and it's a good one. RECENTLY PURCHASED: Gone Girl, Gillian Flynn. Just released in paperback. The Lincoln Conspiracy, Timothy L. O'Brien. Author's names stenciled length-wise through the store. A great touch! Another great touch in the rear above the children's section. These ladies were great! Jeanne, Marisela, & Liane - SUPER staffers at Watchung! Thanks ladies! The Watchung staff and yours truly.